Mariko from Super Eggplant and Kelly from Buzzville have opened a fantabulous online fabric store for Japanese prints — Superbuzzy. I love these little birds. Keep an eye on them, they nearly sold out after opening and new stock will come in frequently. Yum – grapefruit Campari martini gelatin dessert. Also, the pink grapefruit gelatin which I keep eyeing but never get around to making. Molten chocolate center cakes, make by stuffing a little bit of ganache in the center. How to hang your artwork and not screw it up. Apartment Therapy goes for hanging at 57″ on center, some people like higher. A follow up on Jennie’s choices for non-toxic cleansers – Green Home Living magazine check out which eco cleansers work? Aw – French heart shaped sugar cubes with a notch so they can perch on the lip of your cup. I kinda like these anamorphic cups that reflect distorted type from the saucer. And this is not something I really like but the minituraztion caught my eye – the mug boss. Thanks to Stephanie for pointing me towards the site. This weekend Scott is embarking on a tour with Jerin Falkner and Jim Hodgson. It’s called the Please Don’t Feed The Musicians tour and I encourage you to go and check them out if they are in a city near you. It’ll be a nice night out, I promise. Autumn is approaching and I can feel my desire to own a pumpkin shaped cake pan returning. Also, this is where the create your own Twinkies kit escaped to. The publisher of Consumer Reports has a new magazine out about, what else, shopping. It’s called Shop Smart. How to make a surgeons knot, at Cool Tools. Being lazy and impatient (there was no ice in the freezer) I used the tape method, and it worked nicely. I used a clear packing tape and a plastic tool. I think I’ll rub the area lightly with mineral oil before I throw it in the washer. Next up, wax on a jacket left under the candles onstage at the O Lounge. I like to have a stock of fairly inexpensive table wines on hand*, so I was interested when Seattle Bon Vivant posted this tip about Hyatt Vineyards Merlot at Trader Joe’s. I was a little skeptical, I mean, it’s $3, and I have not bought You-Know-How-Many Buck Chuck in years. But that week I found myself near a Trader Joe’s so I went in to look for it thinking about picking up one bottle and maybe some mac and cheese. I was expecting to spot it in a towering display, what I found was a well dressed young woman on her hands and knees in the wine aisle reaching way back into the bottom shelf to get the very last of the Hyatt Vineyards bottles so she could make a whole case. I remarked that that was the wine I’d come to find, and I’d heard good things about it. “It’s great,” she said brushing the dust off of the knees of her extrememly expensive jeans, “you can serve it to your guests and they’ll never know it’s a $3.00 wine.” She didn’t offer to let me take one of her bottles. I was simultaneous gripped with a desire to buy more than just one bottle, and deep mourning at my near miss of having some In The Know wine. I went up to the front desk to ask if they were planning on getting more in, and as I was saying “it’s from Hya….” their wine guy was next to me, holding out a case. So I bought it, a bit gleefully. And it was good. There was none of that obvious sweetness I’ve come to expect in cheap wines. 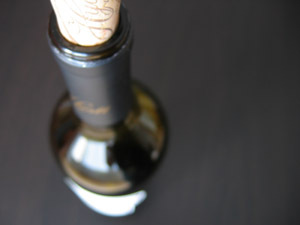 Recently I found that we’d drunk the last bottle without realizing it, and I was sad. A trip to Trader Joe’s turned up no more. Oh well, it was good while it lasted. Thanks to Viv for the tip. * Though lately my tastes have run more towards the less expensive Cline offerings. A cocktail to try, the Lucien Guadin, at The Spirit World. See also, what is Pimm’s Cup? I nearly forgot about the bread, chocolate, olive oil and salt thing from Cooking For Mr. Latte, must try this. At The Amateur Gourmet. Seattlest – Roadtrip Rationale Walla Walla Wineries. Another road trip, sort of, Snoqualamie Gourmet Ice Cream. Ah, Blackberry Bonny Doon Sourbet at Orangette combines two of my favorite things, and gives me a reason to buy the ice cream maker attachment for my mixer. The first time Scott and I visited the Bonny Doon tasting rooms the Framboise that year was way too sweet to sip and the pourer* kept talking up it’s potential to be used in cooking and desserts. The next year the Framboise was so nice, sweet but with huge flavor, I’m glad I tried it despite the first tasting. * I just know that the server at a winery tasting room probably has a special name, but I don’t know what it is, forgive me servers at winery tasting rooms! I’m so pleased to see Seattlest’s report on the showing of Snakes On A Plane which they went to see last night. It bolsters my hopes that SoaP will become the next film for which you being drunk, it being midnight, and some audience participation is pretty much expected. added: Take a look at the wiki audience participation script. I wonder how much the marketing department for the movie had to do with this? Look — Craftzine.com, the website for Craft magazine (an offshoot of Make magazine) is up and running along. All of the biggies in the craft world have been featured, including two from Seattle! Kristin Rask who does the Plush You show at her store Schmancy*, and Stuart who does Sew Dorky, the makers of fine felt donuts and teeth. This morning on Flickr I spotted some robot dolls made by My Paper Crane which are apparently part of Craft’s press kit, how cool. * Schmancy is part of three shops on the same block which are called Fancy (jewelry and accessories), Schmancy (cool toys and collectibles) and Pants (undies). I’m tickled by the coordination. And, they have a collective site here on Livejournal. After spotting it on da*xiang we made this recipe for parmesan chicken bits over at Simply Recipes. It was delicious and a perfect, easy comfort food for my frazzled day. Apartment Therapy often talks up the benefits of undercounter fridges for tiny apartments. We considered getting one for our small kitchen, but decided against it for now. Even so, I’m glad they did a review of a few models since I dream of having one someday, along with a countertop height freezer. Shelterrific’s love for the LG LRBP1031 is pretty persuasive too. Ah, how lovely are the words “cabinet depth”. My lastest post is up at the Readymade blog – it’s about how Pattern Review came to my rescue. I really like this stainless steel magazine rack made by Quasimodo Metal Works. It would be great for keeping cooking magazines in the kitchen. via Modern Cottage.